Singer/songwriter/guitarist Jedd Hughes grew up in the country town of Quorn, South Australia and later graduated from the Australian College of Country Music in 1998. He went on to study music at the South Plains College, Texas, USA and currently resides in Nashville. In April 2002 he appeared on the Grand Ole Opry with Patty Loveless before touring as part of her band. In 2003 Jedd signed a record deal with major US label Universal/MCA. 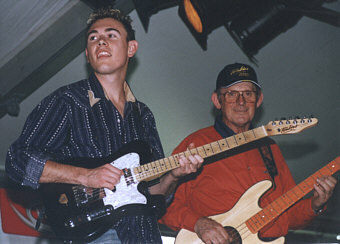 Jedd is pictured here on stage with Allan Tomkins at the Tomkins 2002 Showcase in Tamworth.